Facebook Messenger is the second most used messaging application on the planet with a user base of more than 900 million people. This huge user base uses this app on quite a number of platforms, including smartphones, tablets, PCs and even smartwatches. While those using the application on the most popular mobile OS – Android – can do more than just send a message to a friend on the app, those using Facebook Messenger for Windows 10 Mobile are still dependent on the app’s ability to send and receive text messages. In short, Android and iOS users can easily use Messenger to make both voice and video calls at zero cost. This is regardless of the platform in use, but as long as the recipient is also using the same Messenger app, the call will be placed at no cost. Still, an internet connection is needed for this to happen. On the side of those using the new Windows 10 Mobile, the ability to make voice and video calls will soon be making its way to Facebook Messenger, just like it is already available on other platforms. 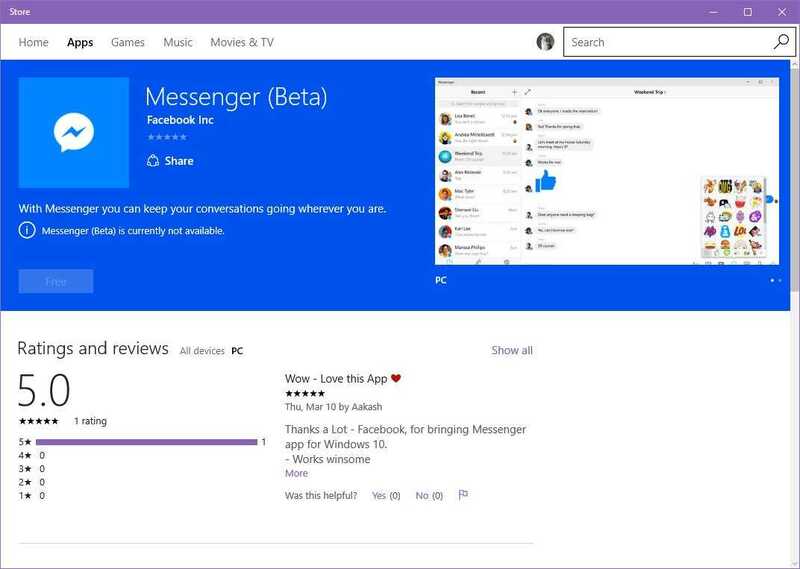 According to reports surfacing from Reddit, it seems quite a number of Windows 10 Mobile users have come across a beta version of Facebook Messenger that features options to make voice and video calls. Being in beta, it means almost everything about the app is still very unstable. This is even evidenced by the fact that when the voice and video call options on the beta app are pressed, the entire app crashes. Despite the crashing, the fact that the options have shown up in the beta version of Facebook Messenger for Windows 10 Mobile is an indicator that the feature is indeed coming very soon. This move will be a huge welcome for those using the Messenger app on Microsoft’s mobile OS, especially since most apps on this platform have been “neglected” when it comes to receiving updates and new features. The fact that Android and iOS users have been able to make voice and video calls on Facebook Messenger for months now yet the feature has not reached Windows 10 Mobile is just one piece of evidence that this platform is indeed lagging behind the rest of the park. It is, for this reason, Microsoft introduced Project Islandwood where developers can skip the hassle of having to code apps from scratch and instead just use the current code but with some tweaks when coming up with Windows 10 Mobile apps.